There is a Router-only path between any two Routers. Any one Router in a Thread network can reach any other Router by staying entirely within the set of Routers. 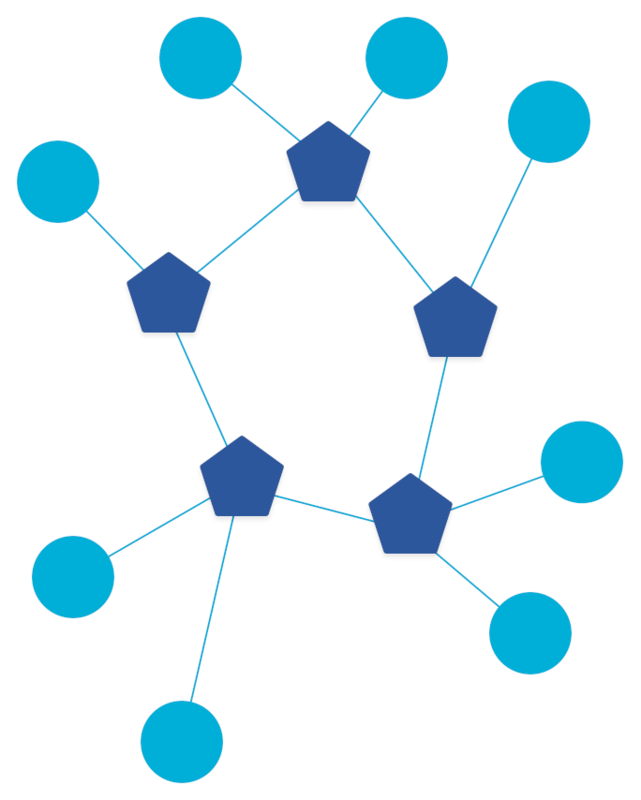 Every End Device in a Thread network is directly connected to a Router. A distributed algorithm maintains the CDS, which ensures a minimum level of redundancy. Every device initially attaches to the network as a End Device (Child). As the state of the Thread network changes, the algorithm adds or removes Routers to maintain the CDS. After attaching to a Thread network, the Child device may elect to become a Router. Before initiating the MLE Link Request process, the Child sends an Address Solicit message to the Leader, asking for a Router ID. If the Leader accepts, it responds with a Router ID and the Child upgrades itself to a Router. The MLE Link Request process is then used to establish bi-directional Router-Router links with neighboring Routers. The new Router sends a multicast Link Request to neighboring Routers. Routers respond with Link Accept and Request messages. The new Router responds to each Router with a unicast Link Accept to establish the Router-Router link. A Link Request is a request from the Router to all other Routers in the Thread network. When first becoming a Router, the device sends a multicast Link Request to ff02::2. Later, after discovering the other Routers via MLE Advertisements, the devices send unicast Link Requests. A Link Accept and Request is a combination of the Link Accept and Link Request messages. Thread uses this optimization in the MLE Link Request process to reduce the number of messages from four to three. A Link Accept is a unicast response to a Link Request from a neighboring Router that provides information about itself and accepts the link to the neighboring Router. 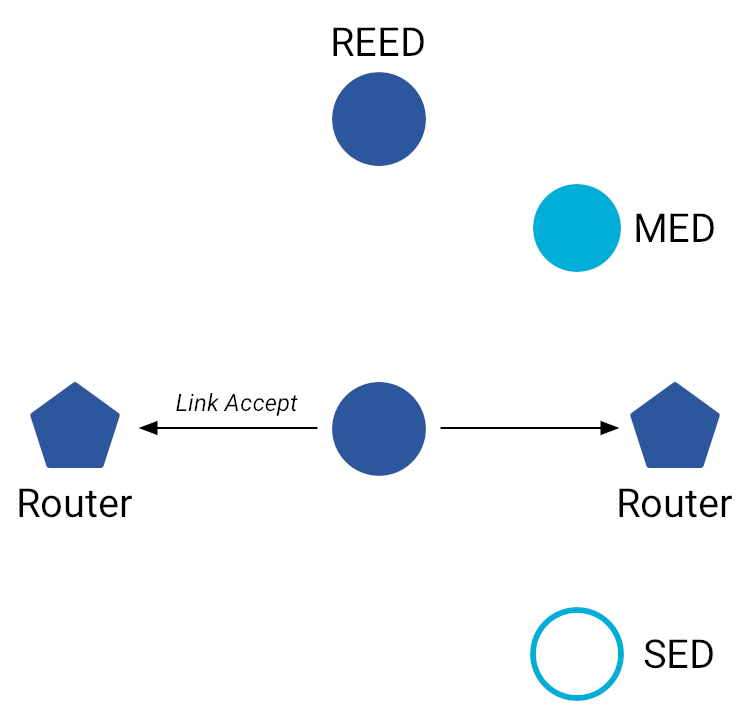 When a Router downgrades to a REED, its Router-Router links are disconnected, and the device initiates the MLE Attach process to establish a Child-Parent link. See Join an existing network for more information on the MLE Attach process. In some scenarios, it may be necessary to establish a one-way receive link. After a Router reset, neighboring Routers may still have a valid receive link with the reset Router. In this case, the reset Router sends a Link Request message to re-establish the Router-Router link. An End Device may also wish to establish a receive link with neighboring non-Parent Routers to improve multicast reliability. We'll learn more about this when we get to Multicast Routing.